As we continue working around the clock to improve HealthCare.gov and the holiday shopping season kicks into gear, we wanted to share some consumer friendly tips for individuals looking for quality affordable health insurance. 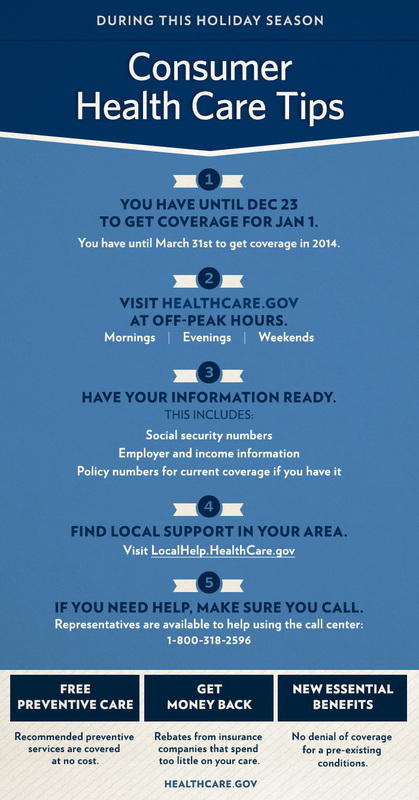 Shop HealthCare.gov during off-peak hours (mornings/nights/weekends). Have your income and tax information ready when you log on. Comparison shop to get the best deal. 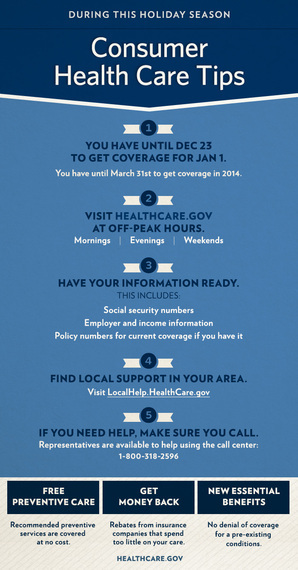 You have until December 23 to get coverage starting January 1, 2014 - and until March 31st to get coverage in 2014. If you need to talk to someone, use the call center: 1-800-318-2596. Reps are available 24/7, in 150 different languages. We continue to work every day to ensure that every American who wants affordable health insurance has access to these new, quality coverage options -- and hope these new tips are helpful to consumers seeking coverage in the days, weeks and months ahead.